School's Out And Teachers Run For Office Over Summer Break In the states where teachers walked off the job this year, more than 70 educators are running for office, including in West Virginia where the teacher walkouts began. Teachers, public employees and their supporters gather outside the state Capitol's gold dome in Charleston, W.Va.
With school out, a lot of teachers are thinking about a wave of protests that had them walking off the job, demanding things like better pay and benefits and more funding for public education. Some of those educators are now running for public office and are on the ballot in North Carolina, Kentucky, Oklahoma, Arizona, Colorado and in West Virginia where those strikes began. Still, others wonder if what has been seen as a movement created by public school teachers can translate to wins for seats in statehouses across the country. For the past 15 years, Brianne Solomon has kept busy during the summer by taking on a part-time job. But this year the art and dance teacher is hitting the campaign trail as a Democratic candidate for the House of Delegates in the state legislature. She says she has tried to compartmentalize her role as a teacher in the small rural community of Ashton, W.Va. — and as a candidate. "I'll just flip the switch, turn out the lights and turn on the lights for campaigning," Solomon says talking about the end of school and the start of her first run for public office. She's one of more than a dozen public educators on the ballot in West Virginia for a state house seat in the November midterms. Counting current and former teachers — as well as those who substitute — it's a near split between Democratic and Republican candidates. Solomon, though, filed to run for office before the rallies at the Capitol building. In fact, all the teachers running in the state did. The deadline to file was back in January — nearly a month before thousands of teachers packed the rotunda in Charleston. Brianne Solomon, a teacher in the small rural community of Ashton, W.Va., speaks with one of her students on the last day of school before she heads out to begin her campaign for state office. "It was more toward the end of [January] where we started seeing that this legislative session really had no interest in helping us — and the ball rolled so quickly," Solomon says. 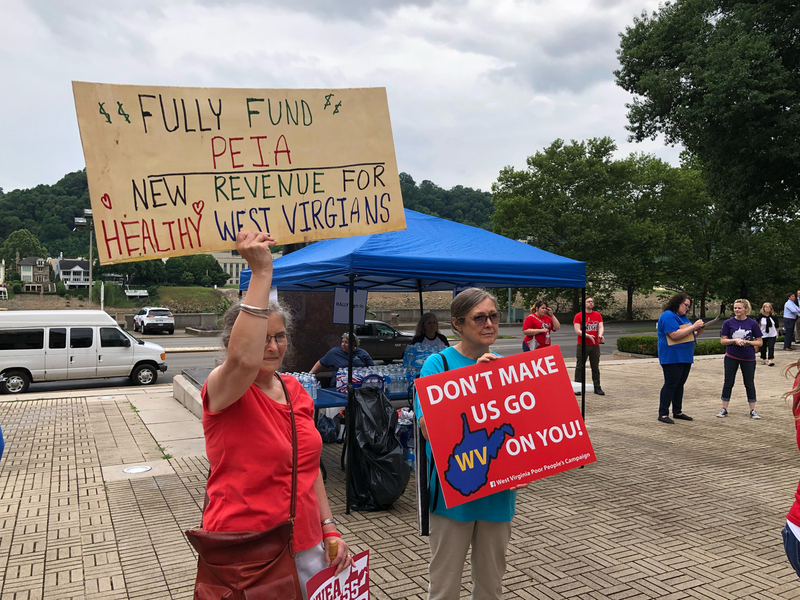 As West Virginia teachers carried on their protests in late February and into early March, talks swirled around the statehouse about turning the momentum into a blue wave in November. Democrats held the majority in both houses of the West Virginia Legislature for eight decades but lost it in 2014. Since then, Republicans here have strengthened their hold. President Trump won the state by more than 40 percentage points in 2016 — helping down-ticket Republicans stretch that majority even further. "You throw out a phrase like 'Remember in November' — it's catchy. So you think, 'That's all we need to do, really' because they were in control so long and they're the first to say, 'We need to do more to back it up,' " Solomon says, talking about her Democratic colleagues who have struggled to gain back seats since 2014. Solomon says that Democrats had become complacent over the past few elections but that she sees the teachers' movement as a way to take back control. Leaders of teacher unions here provided some organization — helping bring issues like salaries and healthcare to the attention of lawmakers — but, even they say the movement grew from the ground up. Since then, it's grown even bigger. It's not just the unions organizing anymore. Don Scalise, a high school social studies teacher, is the chairman of a political action committee raising money for candidates running in West Virginia who support educators and other public employees. He says this movement is bigger than what played out this past legislative session, where teachers scored an average pay increase of five percent. That raise — worked out between the unions, the legislature and Republican Gov. Jim Justice — was part of a deal that ended the strike after nine school days. "As grateful as we are for a five percent raise, that's not going to solve our problem in terms of rewarding good teachers and attracting young teachers to the state of West Virginia," Scalise says. "So, there are a lot of things still at stake for us and all we feel like we have to do is remind people of that." Teachers, public employees and their supporters rally and chant outside the West Virginia state Capitol building. After the strike, Scalise and other teachers formed a PAC called The Future of 55. Its name comes from the 55 counties in West Virginia — a number that was crystallized in phrases like "55 United" and "55 Strong" that made their way into chants and onto poster boards around the capitol. But Republicans and their strategists are doing their best to downplay the impact of the strike on the midterms. Phalen Kuckuck, executive director of the West Virginia Republican Legislative Committee, says the protests had an ieffect in the moment, but he doesn't believe they can carry the Democrats to a majority in November. "It was a sight to be seen. But that does not translate to votes across the state of West Virginia," Kuckuck says. As he points out, despite Republican holdouts that drew out the strike, his party is ultimately responsible for the largest pay raise for teachers and other public employees in decades. "We did give a pay increase. We did it without raising taxes," he says, also acknowledging that issues highlighted by teachers and other public employees aren't going away. 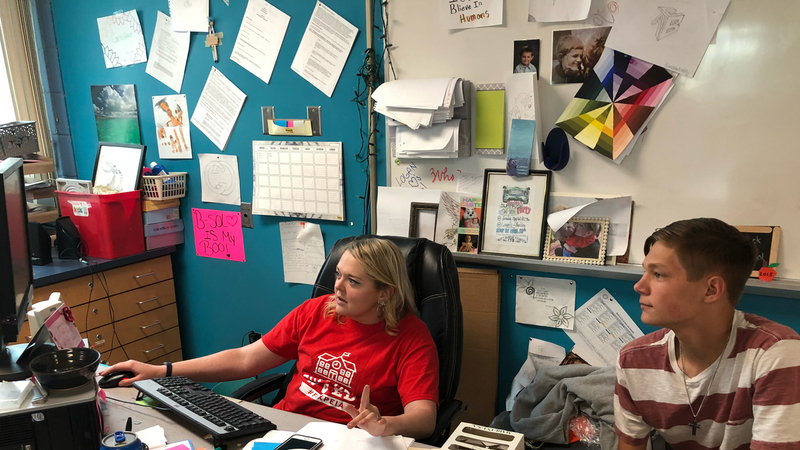 With school wrapped, Brianne Solomon says her goodbyes to her students and gets into campaign mode by heading to a rally at the state capitol. 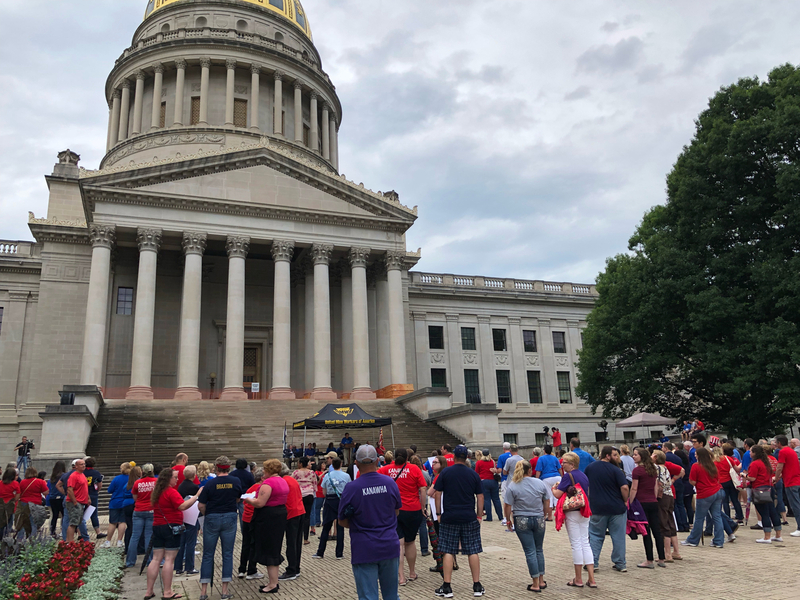 Teachers, public employees and their supporters gathered outside the gold dome to get amped up for a hearing on the healthcare program for public employees. Familiar chants of "55 United" and "55 Strong" came in waves as speakers at the rally — including Democratic candidates for Congress and leaders of teacher unions — acknowledged other candidates in the crowd. "I think it's all good to get these people out and get their names out. People know them" says Solomon, walking from the rally to the public hearing. "Maybe they're not in my district, but they might know somebody. And that's the same for all the candidates. The more we coalesce and communicate, the better it is for all of us." Teachers running for office in Arizona will face primaries in late August. In other states with walkouts this year, more than 70 educators will be on the ballot in November.